Description: Brackets for suspending a projector from a ceiling surface. 1. Maximum weight capacity. Make sure you know the weight of the projector you are supporting and select a mount that states it can hold that weight or more. UL listed products are a better choice as the manufacturer pays to have the mount tested to four times the max weight. 2. Know your ceiling. Most mounts come with a ceiling plate that allows it to be mounted to a wood or concrete ceiling. However, some do not include a ceiling plate, so be wary. Also, if you're mounting to something else (i.e., pipe, I-beam, truss, etc.) 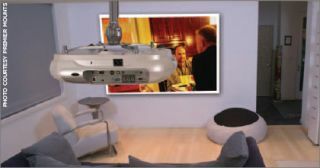 you will need an additional adapter to make the link from ceiling to mount to projector. 3. Flexibility is important. Not all rooms are ideal for projectors. You can't always get your screen to the very top of the wall, which means you need to lower your projector or rely on lens shift and keystone correction, which will harm your final image. This is where an adjustable-height projector mount saves the day. These mounts typically offer a range of adjustment from 8 to 12 inches in height in order to line up with the top of the screen. 4. Tilt, roll, and yaw. All projector mounts offer significant amounts of each. Don't get caught up in the spec war. Unless you are mounting at an extreme angle, few installations require more than 5 degrees of tilt or roll. You don't need to pay more for tilt specs you'll never use. Yaw may be used if the screen ends up in an unanticipated location or your ceiling structure requires the mount to be installed perpendicular to the screen. Make sure your mount offers at least 40 degrees of yaw (360 degrees is best as long as it is free moving and doesn't rely on unthreading the mount from the support pipe). 5. Cable management. Once you have the projector mounted, it's time to tackle those pesky wires. Keep an eye out for projector mounts that incorporate cable management into the body of the mount.